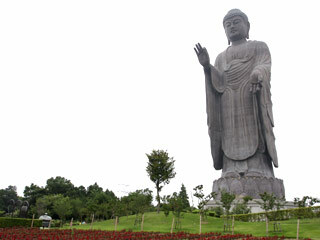 The Ushiku Daibutsu (牛久大仏), located in Ushiku, Ibaraki Prefecture, Japan, is the world's tallest bronze statue. Completed in 1995, it stands a total of 120 meters (394 feet) tall, including the 10m high base and 10m high lotus platform. You can enter inside of the Greatest Buddha. An elevator takes visitors up to 85m off the ground, where an observation floor is located. It depicts Amitabha Buddha and is plated with bronze. This Great Buddha is belong to Pure Land Buddhism. When you visit here by public bus, last bus leave at 16:00, and there is no other transportation. Keep in mind about the last bus. Entrance fee (just park): 500 yen for adult, 300 yen for kids. Entrance fee (with inside tour of buddha): 800 yen for adult, 400 yen for kids. In the winter time, fee will be little cheaper. Experience the greatest and biggest Buddha in the world! When you see Ushiku Daibutsu, the great Buddha in Nara will be a baby because its head is even bigger than lest of Japanese Daibutsu. There is no wander like Ushiku Daibutsu as spiritual monument in the world. It was build for the anniversary for Shinra-shonin who started the Pure Land Buddhism. Ushiku was his home town. To build the Pure Land, they build the greatest Buddha statue in their own Pure Land. There are flower gardens which has all kinds of flowers for all seasons. Also, many festival like fireworks, summer festa, or new years festa held at the garden. At Squirrel and rabbit park, they have monkey show, and play grands where you can play with those animals. There are light show in the summer. Inside the statue itself is a four story building, which serves as a kind of museum. The first floor lobby is dark, and as you enter new age music floats toward you from the darkness. In the center of the room a single shaft of light shines from above onto a cauldron of smoking incense. This room is called Infinite Light and Infinite Life. In this room, you can easily imagine your pure land. 2nd fl. is World of Gratitude and Thankfulness. You can experience the writing sutra here. There is lay sermon on the weekend. 3rd fl. is World of the Lotus Sanctuary. There are about 3,000 Buddha tombs. 4th, and 5th fl. are Room of Mt. Grdhrakuta. There are Buddha's ashes and windows for all four directions. The last bus from Ushiku Daibutsu to Ushiku Station will leave at 5:20pm on weekend.